Colleges and Universities exist to develop the leaders of tomorrow, and it is vital that students are supported to develop sustainability skills during their studies, and then also to pursue careers in this area following graduation if they wish to do so. Growing numbers of students engaging with sustainability issues are looking to follow a career in this area, but Careers and Student Advisors sometimes struggle to understand what this means and how students can best develop both their employability and the quality of their applications for such roles. It is important that support is made widely available. The EAUC-Scotland Office, as part of their 2014-17 programme, identified the need across the UK for written guidance to help anyone looking for or advising on careers in sustainability. Through extensive research in both universities and colleges, and in collaboration with career support organisations, feedback suggested that Advisors were in need of online resources which they could use to learn more about these types of careers, which could also be made accessible to students looking to pursue a career in the sector. 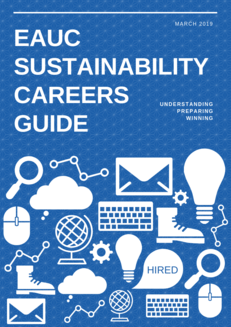 Download the full EAUC Careers Sustainability Guide here! In addition to the Guides a series of three webinars were hosted so that everyone could join the conversation and hear from people working and supporting sustainability careers. Resource on the third part of the Careers Project: Winning a Job in Sustainability, including webinar. Resource on the second part of the Careers Project: Preparing for a Job in Sustainability, including webinar. Resource on the first part of the Careers Project: Understanding Sustainability Jobs. This includes a link to a webinar held on the same topic.